The slaty egret still has its stronghold in the Okavango Delta. afrol News, 2 May - The unique inland delta in Botswana's Kalahari Desert, the Okavango, is slowly changing due to a drier climate, increased grazing and a growing pressure from tourism. The Okavango Delta is one of Africa's most important wetland areas - known from countless nature films - and home to many threatened species. Vulnerable birds, like the slaty egret, are losing their key breeding sites. The Okavango Delta wetland area is currently just over half its maximum size of 20,000 square kilometres, probably because of long-term climate fluctuations. Southern Africa has experienced a decade of drought, which many climate researchers perceive as an omen of a drier climate on the sub-continent due to the world-wide process of global warming. Studies of the ecological changes in Southern Africa's drier regions are still rare. However, a survey team from the Botswana Department of Wildlife and National Parks and the environmentalist group BirdLife Botswana recently completed a one-year survey of the 55,000 km2 Okavango Delta, the world's largest site protected by the international Ramsar wetland protection convention. Their findings were disturbing. The important wetland - which is the main water source of regional wildlife during the long dry season and the main bird breeding site in inland Southern Africa - is shrinking. One decade of drier climate has contributed most to the halving of the wetland area. The Cubango River - originating in the Angolan highlands and reaching the northern Batswana dry lowlands - carries less water and its water reaches the Delta during a shorter period of the year. At the same time, direct human action has infringed on the valuable wetland area. The historical zones of dense reedbeds and water fig islands have largely been destroyed by hydrological changes and fire, the survey team found. Bush fires and a high grazing pressure further have reduced the natural shores of the Okavango Delta. During the study, BirdLife Botswana was in particular interested in the slaty egret (Egretta vinaceigula), a vulnerable water bird living only in Southern Africa. The egret, which has its main breeding grounds in the wetlands of Zambia, Mozambique and Botswana's Okavango Delta, is by now estimated to have a total population of only about 4,000 birds. The survey team managed to collect "valuable data on the ecology" of the egret, Pete Hancock of BirdLife Botswana says. "But one question remains unanswered: where are slaty egrets currently breeding," Mr Hancock asks. Earlier studies had found egret nests in the Okavango Delta, typically in the reedbeds and water fig islands that have now been destroyed. No egret breeding sites were found during the survey. By contrast, slaty egrets feed in shallow seasonal floodplains with short, emergent vegetation - a habitat that is widespread throughout the Delta and has increased through fire and high grazing pressure. Birds spend most of the day foraging for small fish, frogs and aquatic invertebrates which they locate by sight, according to BirdLife. "But despite the abundance of prey, they appear to have a low feeding success," the environmentalists add. The egret, which was already registered on the IUCN's red list over threatened species as "vulnerable", thus seems to be losing one of its main breeding sites - the Okavango. "Several factors threaten the egret," BirdLife noted, "notably increased accessibility and disturbance to reedbeds by cutters and tourists, loss of some feeding areas, destruction of habitat by fire and the increased use of reedbeds by large mammals, especially elephants." The environmentalists hope they still can reverse the negative trends. 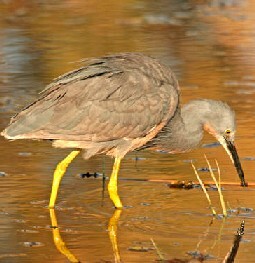 Information gathered from the recent surveys are to be incorporated into a "Slaty Egret Action Plan" that is to help the Department of Wildlife and National Parks, BirdLife Botswana and other stakeholders "to ensure the Okavango Delta continues to provide a safe haven for slaty egrets," according to Mr Hancock.